Lynda has always believed that body wellness/health come from body awareness, and through her ancestral teachings, she has come to produce some of the most ancient, yet modern, health and wellness alternatives on the market. We firmly believe in healthy, long-term relationship with the earth-human resonance, by providing continuous flow of quality products and outstanding services. One day while out clearing the back 40, I accidentally rode my lawn mower over about 2 1/2 acres of poisen oak. This being said, I am allergic and you can imagine! Necessity is the mother of invention, and so Tsaruno Itch Powder was born in 2001. Since then we have found it good for any skin irritation. I put it in a plastic squeeze bottle... bug bites, rashes, poison plants... pooh gone when directions are followed. If you have tried everything for your chronic itching and nothing seems to help, we have good news for you. Tsaruno brings instant relief for itchy skin. We guarantee it will relieve the symptoms of your itch or we will refund your money. Uses sacred clay harvested from our mountains by our Elders. 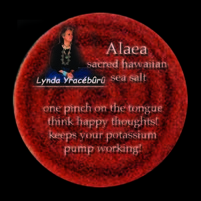 When Maria was struck by lightning our Aryvedic doctor Jini Reynolds told us that her potassium pump wasn't working and that she needed red sea salt. Our Hawaiian relatives had started us using the sacred salt they gather for purification ritual. So the two just went hand in hand. Maria's muscle cramps stopped being so severe, and radiation from the solar flares stopped effecting her so strongly. Put a pinch on your tongue, and think happy thoughts while it dissolves. How do you know if you need it? Does your water not quench your thirst? Then odds are you need it!